If you've been following plus size influencers for a little while you will probably have heard of Bethany Rutter. She's been an outspoken voice in the plus size community for many years, and has written for a number of publications, as well as having her own style blog. The last 12 months have been impressively productive, even by Bethany's standards. Last year she collaborated with Navabi to create her very own Arched Eyebrow collection. And this month see the launch of Plus+, a book of street style photos of fashion forward plus women looking fabulous, currated and edited by Bethany. And if you have a flick through it you might even see a familiar face (in case that wasn't obvious, it's mine!). The Arched Eyebrow collection is modern, functional, stylish and bright. Every carefully constructed piece is the sort that will have a long life in your wardrobe. The pieces are clean and vibrant, and many of them are things I've not really seen in plus before. I am a big fan of patterns, as you well know if you've been following me for a little while, but I really love the strong contrasting colour blocks of this collection. For this looking I am wearing the Blue Wool Mix Shawl Collar Coat paired with the Red Gathered Sleeves Shift Dress. I am currently a 22, but I sized down to a size 20 in the coat, as I think it is meant to be a little over sized, but I prefer something more fitted, and up in the dress to a 24, as they didn't have a 22 in stock at the time and I figured that it was the sort of dress where a little oversize wouldn't matter. I was right. I love both items! They are both beautifully made, in wonderfully lush fabrics, and I think both will get a lot of wear! "Plus-size fashion is daring, experimental and deeply personal... The online plus-size fashion community is loud, international and confident. Millions of #ootd photos are shared everyday, showing off amazing style and beautiful people. 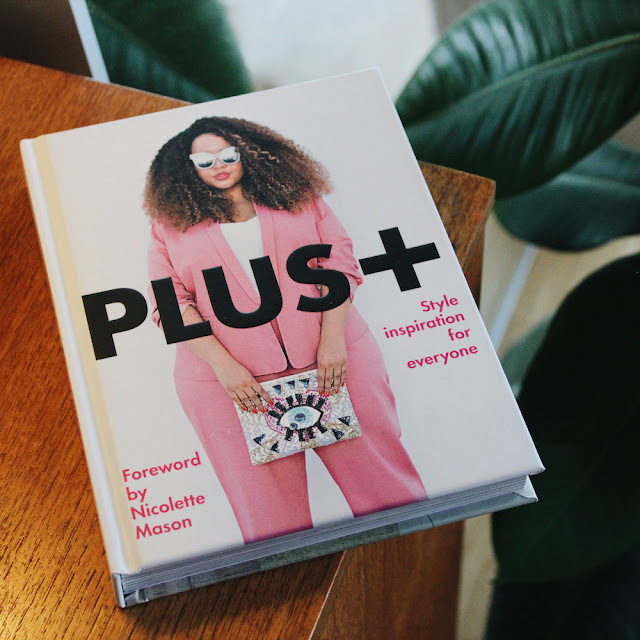 Plus+ gathers together the very best, and celebrates all shapes, sizes and aesthetics - a beautiful, sharply designed, glossy collection to inspire everyone, plus-size or otherwise." So to celebrate the launch of Plus+ later this month (you can pre order your copy online here) I have teamed up with Navabi to bring you an awesome prize. We're giving away a copy of Plus+ as well as £100 to spend at Navabi! Just enter below, via Rafflecopter. Good luck! Really nice look for you Hayley the colours really pop.